Do you want a breast implant that allows you to achieve a natural look and feel, similar to a silicone gel implant, but also comes with peace of mind of a saline implant? The IDEAL IMPLANT® Structured Breast Implant is a new, innovative choice available to women seeking the advantages, without the drawbacks, of those traditional types of breast implants. In a recent interview, board-certified plastic surgeon Dr. Adam Hamawy of Princeton, NJ, talked about this unique option. What do you discuss with women that are considering a breast augmentation? “I spend a lot of time with my patients. If someone’s coming in for a breast augmentation, they’re here for at least an hour. For the first part of it, we are just talking, seeing what you’re trying to achieve, where you’re at, what’s bothering you. But the next part is the education. I always like to talk about five decisions you need to make with the breast augmentation. We need to decide, is it just a breast implant that we’re looking after or do we also need to do a lift. We also talk about where we are going to put the incision, where we are going to put the implants, what size of implant, and what type of implant. “Those are five things everyone has to decide, and in order to decide them properly, you need to be educated even if you think you’ve done all your online research. There are so many different things out there. Even if the patient has seen other surgeons, I like to cover everything to make sure we are complete. Once you have all that information, the pros and cons of each one of them, then you can make a proper decision. How do you help your patients decide on the type and size of breast implant that will be best for them? “As part of every visit, there is an examination. During the exam, I’m looking at a few things. I’m looking at dimensions, how wide the chest is, how wide each breast is. I’m looking at asymmetry. Everyone’s asymmetric, but some are more asymmetric than others. So if it is within physiological limits, where you can’t really tell unless you look closely, then we’re talking about putting the same size implants in. “Also, we’re looking at how much skin and breast tissue we already have that you could cover an implant. So someone who is very thin with very little breast tissue, that will factor into our decisions like whether we are going to go over or under the muscle and what kind of implant we are going to place. We’re looking at your actual muscle there, that pectoral muscle. Some people are doing these really hard workouts in the gym, and we’re going to start considering going above the muscle rather than below. These are all individual things that we have to take into account when we are deciding what kind of implant to place and where to place it. 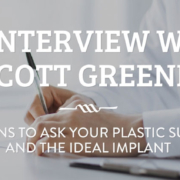 What do you tell your patients about the IDEAL IMPLANT? 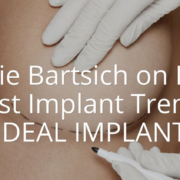 “I’ve been working with the IDEAL IMPLANT maybe two or three years. I came across it at a plastic surgery meeting, and they were talking about a better saline implant. Initially I said, ‘Well, who needs another saline implant when everyone’s going with silicone gel.’ But when you place them side-by-side, it’s definitely an option that fills in a gap. “I tell everyone who’s coming in, if they’re worried about breast implants, ‘This is the most studied device that the FDA has ever looked at, more than anything else.’ But there’s still a certain sense of security when telling someone that we’re going to put in a saline implant that’s going to feel almost as good as the silicone gel, and also give the security of being able to know if it’s ruptured right away. So the IDEAL IMPLANT fills in that gap for people who are still worried about silicone gel, want a natural result, and don’t want the rippling that comes with a traditional saline implant. I tend to find that although most people are happy with traditional saline implants, it does have some issues with rippling and a little bit less natural look in some patients. I haven’t found that to be at all a problem with the IDEAL IMPLANT. What is your advice to women after they receive a breast augmentation? What are the potential complications women should be aware of following a breast augmentation? What should women know about the possibility of implant rupture? “If an implant ruptures, then we need to change that. One good thing about the IDEAL IMPLANT is that if it’s ruptured, you know right away. You’ll look like you have a deflated implant, a flat tire on one side. It’s filled with saline, and your body will absorb that. You go to your doctor, and he’ll schedule to have that removed. “With silicone gel implants, it’s a little bit different. They can rupture, but it doesn’t go everywhere, it doesn’t go anywhere at all. What it tends to do is stay in that space. It might cause that capsule we were talking about to form a little bit harder, so it might feel a little bit different, it might look a little bit different, or might be a little bit painful. There’s nothing specific in that case. You actually have to get either an MRI or an ultrasound to confirm that there’s a rupture there. “The newer silicone gel implants are a lot better than the earlier generation. So right now, if I have a ruptured silicone gel implant, it’s easy to take out. You go in there and pull it out, and there is very little residue that’s left over depending on how old it is. If you have a silicone gel implant that’s over ten years old, it’s a little bit more difficult, especially with the older generations. It could take sometimes hours to get all that leaked silicone gel out. What characteristics should women look for in a plastic surgeon? “You want someone that is going to give you options, not someone that’s telling you, ‘This is what you have to do and that’s all I do, all the time. I just do silicone gel implants. Or I just do implants that go under the arm.’ If someone does just one thing, then they’re probably not tailoring it toward you. So one consideration is to see how many options they are giving you. “Two, see how much you are being involved in the conversation. Are they actually sitting down with you, talking to you, giving you different choices and educating you so that you are coming to a decision together? “And, three, I encourage people to shop around. I don’t think you need to see a million doctors, but I think maybe two or three. It gives you a sense of perspective and even if you like your first doctor more than anybody else. When you go to someone else, it’ll secure your decision and you’ll know, ‘I like that person, and now I know why.’ When people come and tell me I’m going to see a few more other people or I’m seeing someone else, I encourage that. It makes me secure that you’re a little bit more educated, that you know what’s out there, and what you are getting. Considering breast implants in Princeton? Contact Dr. Adam Hamawy today to discuss your options. Simply call 609-301-0760 or visit www.drhamawy.com. Dr. Hamawy’s office is located at 106 Stanhope Street, Princeton, NJ 08540. Call today for more information on IDEAL IMPLANT® Structured Breast Implants. How do I Choose Between the Plastic Surgeons Near Me?